Many people I know have a Tales of the City moment. For some it was back in 1978 when the series started. For others it was not until 1993 when the series that immortalised Barbary Lane hit our TV screens. As for me, I came late to the series. I had just moved to London after university when Significant Others was published in the late 80s. I thought I'd died and gone to heaven when I met Mrs Madrigal and her impromptu 'family' and discovered there were four more, earlier, and as yet unread, tales to explore. I couldn't tell you which of Maupin's kaleidoscope of characters was my favourite - Michael (mouse) Tolliver and his unfeasibly handsome but ultimately doomed boyfriend Jon; Mary Ann Singleton - utterly uncool and straight off the bus from Ohio (not a million miles from yours truly); or hippy bisexual Mona Ramsay whose parentage is the pivotal plotline of book three. But presiding over them all was Mrs Madrigal, the mysterious dope-smoking landlady of the boarding house to which they all gravitated, 28 Barbary Lane. Mrs Madrigal with her mysterious history, long late night conversations and bohemian sense of style was the fantasy grandma I never had. When many years later I finally made it to San Francisco, Macondray Lane in Russian Hill (immortalised as Barbary Lane) was one of my first ports of call. The wooden steps that led to it spidering up the hill just as the staircase leading to a fairytale land should. Now in her 90s, the queen of that land finds herself the focus of the ninth - and allegedly final - book in the Tales of the City series, The Days of Anna Madrigal. I say allegedly - Maupin has pledged to end the series before. Even now, I refuse to believe him. It's hard to say much about this wonderful book without fear of a spoiler. If you've followed the series from book one, I can't recommend this highly enough - it's a bittersweet sojourn with much loved friends and a few mysteries unravelled. If you haven't... I suggest you start at the beginning and read all nine. You have a treat in store. But is The Days of Anna Madrigal farewell? Maybe more au revoir. 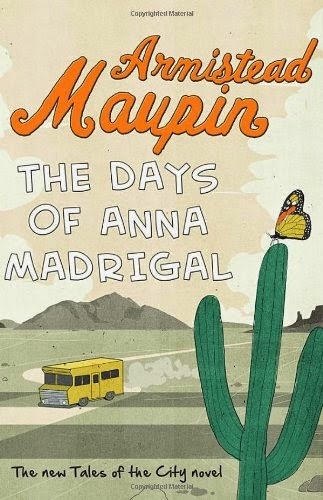 The Days of Anna Madrigal by Armistead Maupin is published by Doubleday. See the entire Tales of The City backlist here.